Welcome to the first edition of the DCRC E-Newsletter for 2015. It’s chock full of great information, including why you need to strategically plan for heat stress this season and an update on current reproductive research. Also be sure to check out the 2015 Sponsorship Guide to learn more about the various sponsorship levels so you can identify which opportunities best fit your company’s goal to support and partner with DCRC in 2015. We depend on your support to help us increase membership, grow producer participation and deliver relevant, engaging reproductive resources to the dairy industry—we look forward to strengthening this partnership in the coming year. “Progeny Testing and Genomics: Where are we and where are we going?” by Chuck Sattler, Select Sires, Inc. These materials and other educational materials are available to DCRC members in the Members Section of the website. Not a member? Here’s how to join DCRC. Sign up today to participate in the first DCRC webinar of the year. It’s slated for March 20 at 11 a.m. Central time and will feature Dr. Milo Wiltbank, University of Wisconsin dairy reproduction specialist discussing how to better manage anovular cows. Visit here to reserve your spot! It’s a good time to mark your calendar for the 2015 Annual Meeting. It will be held at the Adam’s Mark Hotel in Buffalo, New York, November 12 – 13, 2015. We’re looking forward to seeing you there! Cows that return to normal estrous cycling by 21 days in milk have several things in common, compared to those that do not resume cycles so quickly. In the January 2015 Journal of Dairy Science, researchers at the University of Florida detailed several of these factors. Therefore, the scientists suggest that producers should pursue strategies that prevent extended dry period length and loss of body weight. And also work to reduce the incidence of metritis, as well as metabolic and digestive problems to improve early cyclicity postpartum. Researchers in Ireland recently explored how to use automated activity monitors to determine the best time to inseminate cows. The results were published in the March issue of the Journal of Dairy Science. The objective of the study was to determine the relationship between observed estrous-related behavior, activity clusters (as detected by automatic activity monitor), endocrine profiles and ovulation time. The researchers determined that there was a relationship between these factors. This means that activity monitors can help producers identify the optimum time to perform artificial insemination (A.I.) before the predicted time of ovulation. This optimum time is, on average, between nine and 15 hours after the activity cluster has been triggered. Are blood pregnancy tests or milk pregnancy tests more accurate? Researchers at the University of Wisconsin recently conducted one of the first studies to directly compare factors associated with blood and milk pregnancy-associated glycoproteins (PAGs) levels during the first trimester of pregnancy in Holstein cows. Their findings will be published in an upcoming issue of the Journal of Dairy Science. Stage of gestation, parity, pregnancy loss and milk production were associated with similar relative PAG levels in both blood and milk tests. Milk PAG levels were about 2-fold lower than blood PAG levels. Based on weekly PAG profiles in blood and milk samples, the optimal time to conduct a first pregnancy diagnosis is around 32 days after timed-artificial insemination (TAI), when blood and milk PAG levels are at an early peak. Conducting either the blood or milk PAG test during the low point in blood and milk PAG levels results in poor overall accuracy. The low point occurred 53 to 60 days after TAI for the plasma PAG assay and from 46 to 67 days after TAI for the milk PAG assay. Because of pregnancy losses, all pregnant cows should be submitted for a pregnancy recheck 74 days or later after A.I. Heat stress takes a serious toll on U.S. dairy production every year. Despite large capital investments in cooling equipment, milk production and reproductive performance drastically decline during periods of heat stress. Producers first notice an immediate effect due to reduced milk production, but the impacts of heat stress linger beyond its record on thermometers. Heat stress also has a negative impact on a dairy farm’s future by reducing peak milk production of cows that go through the transition period during periods of heat stress. The impact of reduced peak milk production often lingers into late fall or early winter. Of course, cows can be managed and cooled to minimize the impact of heat stress—the key is to do so in a way that best fits each operation. The method used will vary depending on the severity of the climate and the ambient relative humidity. Regardless of the cooling methods chosen, it’s essential to minimize variation in the cow’s core body temperature during periods of heat stress to maximize milk production and reproductive performance. At issue is the fact that heat stress imposes dramatic challenges to the metabolism of high-producing animals. It forces changes in many metabolic pathways as the animal attempts to maintain equilibrium of its internal environment when faced with the external change of rising temperatures—while adjusting its productive output. For example, cows pant when heat stressed, and panting leads to respiratory alkalosis, in addition to rapidly reducing feed intake. Plus, a 30% to 50% reduction in energy utilization efficiency for milk production occurs during heat stress. Lactating dairy cows subjected to heat stress go into negative energy balance as feed intake drops more quickly than milk yield. Several studies indicate that lactating dairy cows losing greater than 0.5 units of body condition during the first 70 days in milk had longer postpartum intervals to first-detected estrus and/or ovulation. When chronic heat stress occurs, cows acclimate metabolically. This leads to another set of challenges. These alterations include a shift in carbohydrate metabolism, including changes in insulin concentrations in blood. Production of glucose from the liver and metabolism of glucose by muscle are altered during heat stress. Another potential heat-stress-related challenge to dairy cow fertility is increased circulating plasma urea nitrogen concentrations. Researchers theorize that these elevated plasma urea nitrogen concentrations may worsen the decrease in fertility frequently observed during periods of heat stress. While you cannot completely remove heat stress for your herd, there are several step you can take to reduce its detrimental impacts. First and foremost, cool dry cows. Dry cows traditionally receive little protection from heat stress because they are not lactating and it is incorrectly assumed they are less prone to heat stress. But that’s not the case. In addition, abrupt physiological, nutritional and environmental changes cause these cows additional stress. These changes can increase a cow’s susceptibility to heat stress and have a critical influence on postpartum health, milk production and reproduction. Heat stress during this period can affect endocrine responses that may increase fetal abortions, shorten gestation, reduce calf birth weight and postpartum milk yield and reduce follicle and oocyte maturation associated with the postpartum reproductive cycle. Use multiple cooling methods. It’s been shown that dry cows cooled with feed line sprinklers, fans and shade compared with cows cooled with only feed line sprinklers produced more 60-day milk with no difference in body condition score changes, incidence of postparturient disorders or serum nonesterified fatty acid (NEFA) concentrations. Identify problem areas. Use available tools to investigate the locations on your dairy where cows experience heat stress. For example, temperature monitoring equipment can be used to monitor cows’ core body temperatures. Then you can analyze the data after several days of monitoring to see where on the dairy core body temperatures are elevated. This information can be used to improve cooling strategies in these locations. Provide adequate shade and cooling. A minimum of at least 38 to 45 square feet of shade per mature dairy cow is required to reduce solar radiation. Spray and fan systems should be used in the holding pen, over the feeding areas (especially in some free stall barns) and under shades on dry lot dairies in arid climates. Include exit lane cooling as an inexpensive way to cool cows as they leave the parlor. Access to clean water troughs when cows leave the milking parlor, at two locations in dry lot housing, and at every crossover between feeding and resting areas in free stall housing is recommended. Also note that sand bedding provides a more comfortable resting surface and increases cow comfort during periods of heat stress. Lastly, consider adapting your reproductive program to decrease the negative effects of heat stress. Repeated research shows that when timed-artificial insemination (A.I.) programs were used, pregnancy risk was improved under thermal stress conditions compared with A.I. based on expressed estrus. Embryo transfer also has been reported to improve pregnancy rates during summer by removing the need to detect estrus. As a result, embryo transfer can significantly improve pregnancy rates during summer. Recent developments have improved embryo resistance to heat stress. These developments include the use of both genotype manipulation and the addition of survival factors—such as insulin-like growth factor-1 that protects cells from a variety of stresses—and may further improve pregnancy rates associated with embryo transfer. Additional work is warranted to improve reproductive performance of cattle in hot environments, as well as effects of heat stress during the transition period on subsequent lactation. However, the recommendations discussed previously can help you significantly reduce the effects of heat stress on your herd. I am a fourth-generation dairy farmer, and was born and raised on Homestead Dairy. We milk 3,400 cows at three locations. All the cows calve at one facility, which is also our hospital facility so we can manage all of our special needs cows in one place. Fresh cows are moved to the other locations after the transition period. We raise our heifers for the first six months at our farm and send them to growers after that time. My role on the dairy is to oversee the heifer operation, manage employees, balance diets and keep the computers running. I’ve attended the DCRC Annual Meeting for the past six years and been a member of the organization since 2012. One of the biggest things I learned was that better management of the heifer breeding program can significantly reduce heifer-rearing cost. The other was the many different methods of synch protocols to breed anovular cows. We use the G6G protocol on cystic cows and it has worked very well for us. I believe that reproduction is the key to a successful dairy because if you cannot get cows pregnant they will not have another lactation—which limits a farm’s productivity and profitability. However, I think that compliance is a challenge to successful reproduction. I believe that the biggest challenge to the industry is that some dairies are not diagnosing cows that are not cycling, and putting those cows on a protocol to get them to cycle. Even on our farm with the Pocket Cow Card (a handheld software program from Valley Ag Software that is paired with Dairy Comp 305® and runs on a handheld computer), if a cow is scheduled for synchronization and is in the hospital, she gets missed. That can be very frustrating when we spend the money to start synchronization and don’t end up with a breeding at the end. The Dairy Cattle Reproduction Council (DCRC) has announced the 2015 Reproduction Awards program, which recognizes outstanding dairy operations for reproductive efficiency and well-implemented management procedures. Nominations are now being accepted for the 2015 program. Dairy operations must be nominated by professionals who serve the dairy industry, such as veterinarians, extension agents, A.I. and pharmaceutical company representatives, plant and co-op field staff, consultants, and others. Nomination forms are due by April 30 and may be completed online or mail to the following address. Judges will review applications and select the top herds, who will be asked to provide additional information about their operation. This information will help the judges select Platinum, Gold, Silver, and Bronze winners. Award recipients will be honored at the 2015 DCRC Annual Meeting in Buffalo, New York on November 11-13, 2015. For more information about the Reproduction Awards Program or to nominate a herd online, visit 2015 DCRC Reproduction Award page. Western Dairy Management Conference, March 3 – 5, Reno, Nev.
Professional Dairy Producers of Wisconsin Annual Business Conference, March 18 – 19, Madison, Wis.
Western United Dairymen Annual Convention, March 18 – 20, Yosemite, Calif.
Central Plains Dairy Expo, March 24 – 26, Sioux Falls, S.D. 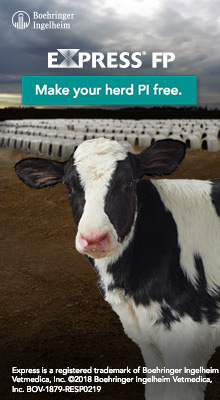 Dairy Calf and Heifer Association Annual Conference, March 31 – April 1, Middleton, Wis.